In the pharma and biotech industries, steroid receptors are mainly produced using baculovirus with only a small fraction amenable to production using E.coli. The reason for this is steroid receptors produced in E.coli are typically misfolded and are unsuitable for drug screening since the Hsp90 chaperone system is required for their native folding and biological activity. Though E.coli has Hsp90, it is evolutionarily distant from mammalian Hsp90 and cannot facilitate the native folding of mammalian Hsp90-dependent proteins. Due to cost versus yield, mammalian protein expression systems are hardly ever used for commercial production of steroid receptors. 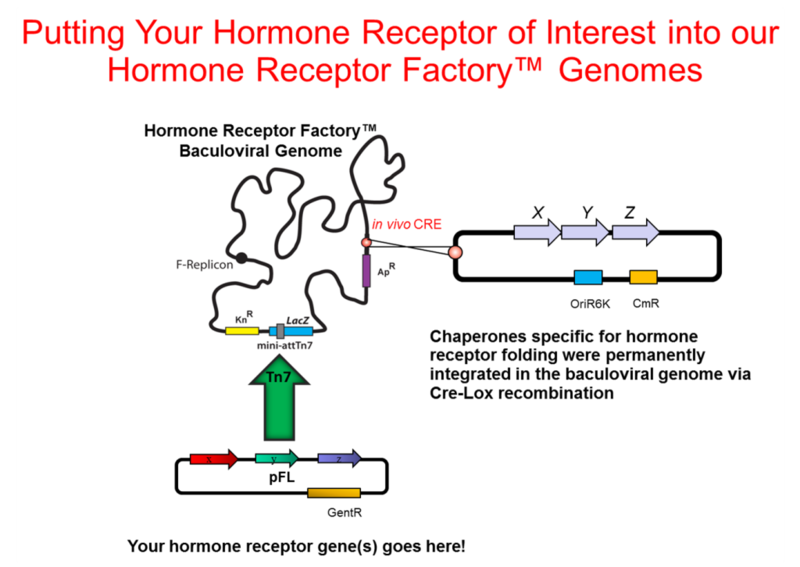 We have developed baculoviral genomes with integrated copies of entire chaperone machineries comprising up to 7 co-expressed chaperone proteins built around a Hsp90 core. The components were selected from the literature to boost solubility and yield of a broad variety of human steroid receptors.